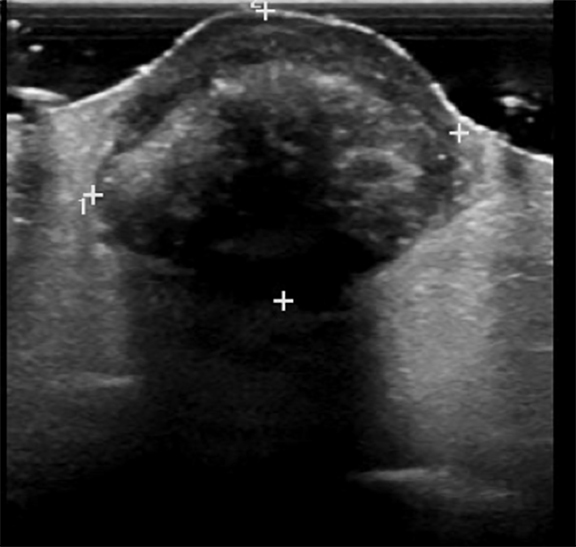 A 56-year-old woman presented to the breast imaging center with a several-month history of an enlarging, superficial, firm and non-tender palpable lump in the left breast at 12:00 (Figure 1). The patient was post-menopausal, had no personal history of any type of cancer, and had no family history of breast cancer. 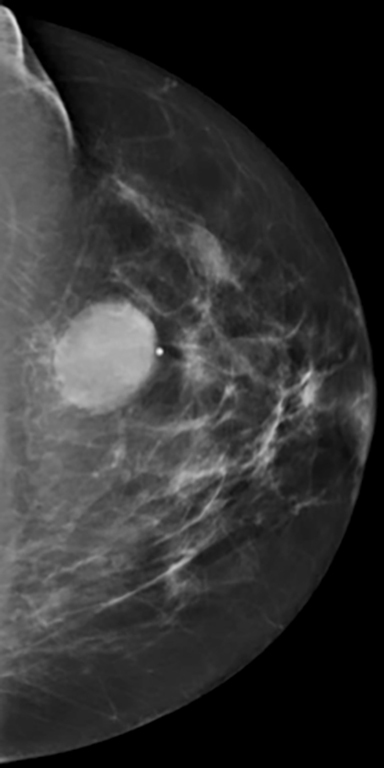 Diagnostic mammography and breast ultrasound were performed for further evaluation of the palpable lump. Mammography in the craniocaudad and mediolateral oblique planes demonstrated a well-circumscribed, equal-density oval mass measuring approximately 2.5 cm at 12:00 in the left breast at the site of the palpable lump indicated by a metallic BB marker (Figure 2). 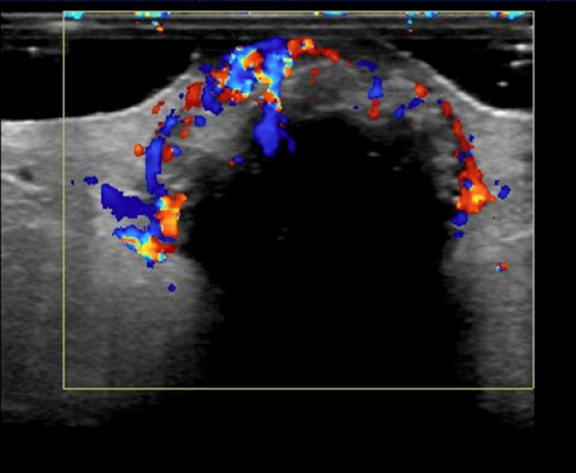 Ultrasound revealed a circumscribed heterogeneous dermal mass with posterior acoustic shadowing and marked peripheral color flow measuring 2.6 cm. There was an abrupt interface with the normal surrounding tissue, and there was no associated skin thickening or subcutaneous edema (Figure 3). An ultrasound-guided biopsy was not performed due to the marked vascularity associated with the lesion. Rather, surgical excisional biopsy was recommended and subsequently performed. Final pathology confirmed a pilomatricoma with no associated atypia or malignancy. Pilomatricoma is an uncommon, most-often benign hair matrix tumor rarely diagnosed in the breast. The malignant counterpart has a similar clinical and imaging presentation, and it is therefore difficult to distinguish between benign and malignant disease without complete histopathologic analysis. Treatment involves complete surgical excision of the lesion, and recurrence of benign PM is rare in this setting. Souto MP, Medeiros Matsushita M, Medeiros Matsushita G, Souto LR. An unusual presentation of giant pilomatrixoma in an adult patient. J Derm Case Rep. 2013; 7:56-59. Sinhasan SP, Jadhav CR, Bhat RV, Amaranathan A. Pilomatrixoma – Presented as hypopigmented tender nodule: diagnosed by FNAC: A case report with review of literature. Indian J Derm. 2013; 58:405. Nori J, Abdulcadir D, Giannotti E, Calabrese M. Pilomatrixoma of the breast, a rare lesion simulating breast cancer: a case report. J Radiol Case Reports. 2013; 7:43-50. Belliappa P, Umashankar N, Raveendra L. Bullous pilomatricoma: A rare variant resembling bouncy ball. Int J Trichology. 2013; 5:32-34. Whittemore K, Cohen M. Imaging and review of a large pre-auricular pilomatrixoma in a child. World J of Rad. 2012; 4:228-230. Allaoui M, Hubert E, Michels JJ. Malignant Pilomatricoma: Two new observations and review of the relevant literature. Turkish J Path. 2014; 30:66-68. Benign pilomatricoma of the breast. Appl Radiol. Prepared by Drs. Borders and Fitzpatrick while practicing as breast radiologists and co-Medical Directors of the University of Arizona Breast Imaging Center, Tucson, AZ, and Dr. McClenathan while serving as an associate professor in the Department of Surgery at the University of Arizona, Tucson, AZ.